by doing needlework. Her exquisite embroidery was especially favored by ladies. landscape in her dreams through her brushes, she unexpectedly revealed the talent in painting and statuary. talented naïve artist in Far East. 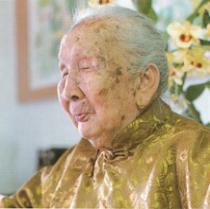 She passed away on 1991 at the age of 90 in Taipei with her family.